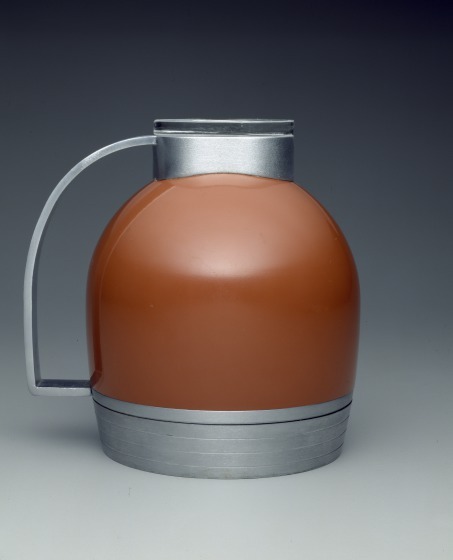 Henry Dreyfuss's thermos is an accomplished example of streamlined design. The forms of the handle, jug, and lid are harmoniously integrated into a continuous shape that follows all the canons of streamlined design. The flat lid, neck, and bottom of the handle, along with the horizontal lines molded into the base, cleverly emphasize horizontality, while the gentle, downward curves of the body, echoed by the perfectly proportioned handle, give the unmistakable feeling of surfaces delicately sculpted by the flow of air around them. This thermos (model no. 549) was available in several sizes and is typical of the new types of materials and streamlined designs introduced in the 1930s. 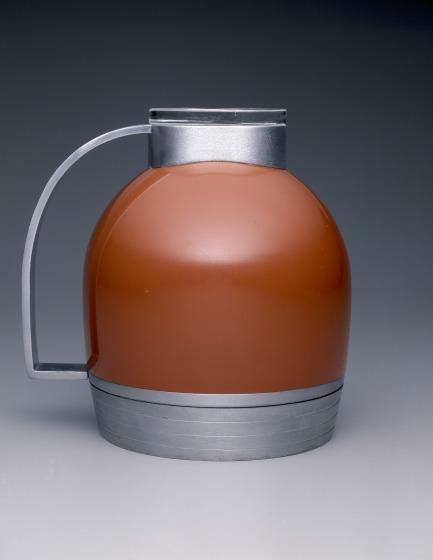 The inner glass thermos bottle is enclosed in an aluminum and enameled steel shell. Some firms, like Gorham, had introduced lines of aluminum wares earlier, but it was in the 1930s that the metal was first used extensively. Here the material is given a "machine" aesthetic through bold geometric shaping and a brushed surface. After World War II, stamped and spun aluminum table ware became increasingly popular. The presence of the designer's name in facsimile script on this object is important. Henry Dreyfuss (1903-1972) was one of this country's most famous industrial designers during the second quarter of the twentieth centruy. By marking its wares with his name, the manufacturer hoped to increase sales to consumers who desired "designer" products. Charles L. Venable, Silver in America, 1840-1940: A Century of Splendor (Dallas, Texas: Dallas Museum of Art; New York, New York; Harry N. Abrams, Inc., 1994), 354. Martin P. Eidelberg, _Design 1935-1965: What Modern Was (_New York: H.N. Abrams, 1991), 82.